All jar mills are built with special no-creep roll design. One roll is convex, the other is concave. Jars stay centered, won’t work off rolls. No clamping or fastening of jar is required. Three-position adjustment securely mounts idler roll, yet it can be quickly changed to handle standard size 000 through No. 2 Roalox jars or other round containers 2" to 9" in diameter. Rolls are 2" in diameter and made of long-wearing, oil, solvent and chemical-resistant Neoprene rubber; they bleed off static electricity generated by rotating jars. Spare parts are available from stock. Totally enclosed DC drive motors permit solid-state control of roll speed. Machines have speed range of between 20 and 300 RPM. Options: Digital tach & timer (Not available on Explosion Proof Models). Designed with sheet metal pans under each tier of rollers. Pans contain jar contents should spillage or breakage occur. 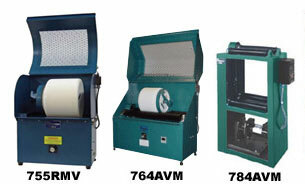 The machines as shown do not comply with OSHA Regulation 1910-212 (a) (4), Barrels, Containers and Drums. It is the user’s responsibility to supply equipment as may be required by OSHA for a particular operation. Model No. No. Tiers Max # Jars Overall Dims Motor Loading HP Approx. Max Wt. Shipping Wt. Long roll jar mills are designed specifically for applications where space is at a premium. Available in single and multiple-tier models. Roll lengths: 36, 48, 72 inches. Motors - Mills are furnished with motors and drives under rolls, TEFC or Explosion Proof. Rolls are 2-1/2" in dia. Made of long-wearing, oil, solvent and chemical-resistant Neoprene rubber; bleeds off static electricity generated by rotating jars. Free-turning ball-bearing jar stops mounted at each end of drive rolls assure jars remain on rolls. 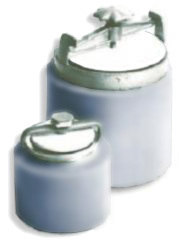 Jar positioners made of long-wearing polyurethane are available at extra cost for any long roll jar mill. They keep jars separated, positioned exactly. Simple to install, quickly moved to any position. 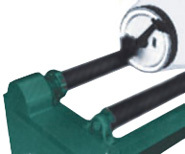 Three-position lateral spacing adjustment of idler roll allows mills to handle standard size 000 through No. 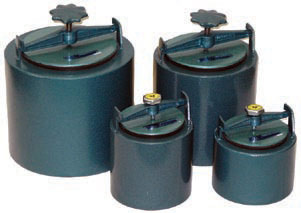 6 Roalox jars or round containers from 2" to 15" diameter. Options: Digital Tachometers, automatic timers, and jar positioners. 3-position lateral adjustment for idler roller. Free-turning ball-bearing antifriction jar stop. Lifetime lubricated and sealed ball bearing. Model No. No. Tiers Roll Length Overall Dims Motor Loading HP Approx. Max Wt. Per Tier Shipping Wt. impact-resistant body minimizes chipping and breakage. Positive lid locking bar and hand wheel for quick, easy opening and closing. Precision ground cover and gasket seat assure leakproof fit. Wide mouths for fast emptying, cleaning, loading. 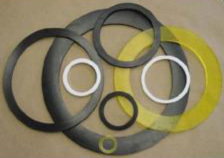 Gaskets are oil, solvent and chemical-resistant Neoprene rubber. Options: Solvent-proof Solvoflex (water soluble PVA). Viton® and other materials are available for gaskets. Same design features as Roalox mill jars. Ultra-high fired ceramic body composed primarily of high-grade aluminum oxide. Extremely high abrasion resistance, long service life, negligible contamination factor. Recommended where silica contamination must be held to an absolute minimum. Available in 7 standard sizes in stainless steel, with or without internal lifter bars. Easy to use, fast cleaning. Feature wide mouths, curved inside corners. Model 611 (without Lifter Bars) and MODEL 611L (with Lifter Bars) Unlined Steel Grinding Jars is shown in the picture. All sizes have quick-change snap-in liners. This feature is especially significant when varied materials are milled and cross contamination must be avoided. Using a separate liner for each material protects the product, saves clean-up time, reduces number of jars required. Note: Cover liners are not snap-in; a different cover is needed for use with each liner. Buna-N,EPDM, Low-Ash rubber, Neoprene, and Polyurethane liners are available. ML-611-00 Unlined Grinding Jar w/o Lift, 0.3 Gal P.O.R. ML-611-0 Unlined Grinding Jar w/o Lift, 0.5 Gal P.O.R. ML-611-1 Unlined Grinding Jar w/o Lift, 1.3 Gal P.O.R. ML-611-2 Unlined Grinding Jar w/o Lift, 2.3 Gal P.O.R. ML-611-3 Unlined Grinding Jar w/o Lift, 3.4 Gal P.O.R. ML-611-4 Unlined Grinding Jar w/o Lift, 4.6 Gal P.O.R. ML-611-6 Unlined Grinding Jar w/o Lift, 6.6 Gal P.O.R. 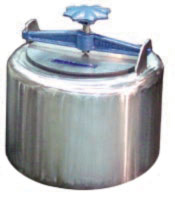 ML-611L-00 Unlined Grinding Jar w Lift, 0.3 Gal P.O.R. ML-611L-0 Unlined Grinding Jar w/Lift, 0.5 Gal P.O.R. ML-611L-1 Unlined Grinding Jar w/Lift, 1.3 Gal P.O.R. ML-611L-2 Unlined Grinding Jar w/Lift, 2.3 Gal P.O.R. 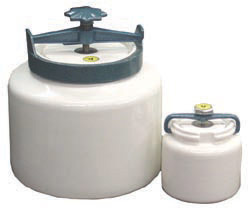 ML-611L-3 Unlined Grinding Jar w/Lift, 3.4 Gal P.O.R. ML-611L-4 Unlined Grinding Jar w/Lift, 4.6 Gal P.O.R. ML-611L-6 Unlined Grinding Jar w/Lift, 6.6 Gal P.O.R. 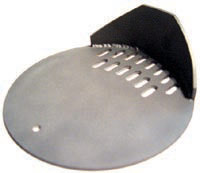 Discharge covers are made of stainless steel with a lip for convenient pouring. Grinding media is retained while product is drawn off. Available for all jars except size 000. When ordering, specify size and jar model on which cover will be used. The extra-wide mouths speed emptying, cleaning and loading, jar sizes 1 through 6 are designated Model 774A and have the metal collar and locking bar shown. A slightly different method of securing the lid is used on sizes 000, 00 and 0 (designated Model 774B), which have a hook bar without the metal collar, as illustrated. High-density, ultra-high fired Burundum® is the ideal medium for wet or dry milling. High specific gravity and cylindrical shape give it greater weight per volume, more contacts per mill revolution, greater area of attrition, with each contact. Result: faster, finer grinding or dispersion, often cutting milling time in half. Tough, hard, non-porous surface is chip-resistant, easily cleaned and unaffected by most acids or alkalies. Non-conductive, non-magnetic, with excellent resistance to mechanical and thermal shock. 1.6 times denser than high alumina. Hard, non-porous surface, chip resistant, easily cleaned. Unaffected by most alkalies and acid. Non-conductive, non-magnetic, excellent resistance to mechanical and thermal shock. Hard, tough, non-porous, chip-resistant surface. Unaffected by most acids or alkalies. Non-conductive, non-magnetic, resistant to mechanical and thermal shock. Beads available. Note: With a specific gravity of 3.4 the charging factor of high density alumina balls is approx. 6-1/2 lbs./gallon * Specialty grinding media & dispersion bead media available. Note: With a specific gravity of 3.42, the charging factor of Burundum (pounds of media to be used per gallon of total jar capacity to give a 50% media charge) is approximately 9 pounds/gallon. NOTE: With specific gravity of 5.5, the charging factor of zirconia is approximately 9 lbs./gallon. When scaling up from lab mills to larger production units, it is suggested the same size media be used. These units save time, labor and money in applications where mixing is performed by rolling the container. Fully adjustable to roll any round container from a 5-gallon pail to a 55-gallon drum. Motors - 3/4HP is 115/230V, 60 cycle, single phase totally enclosed. 1HP is 230/460V, 60 cycle, three phase, totally enclosed. Explosion proof motors are available on special request. Heavy-duty 6" diameter Neoprene wheels, eight under each drum, can be moved to clear hoops and bungs permitting unlimited latitude in type of container rolled. Neoprene wheels bleed the static electricity generated by drum rotation. 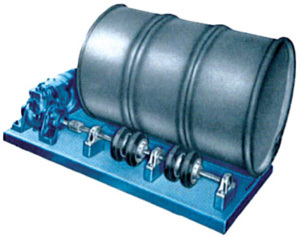 Smooth running ball bearing pillow blocks and solid welded steel base for heavy-duty service. Constant speed drive: 144RPM which rotates 55-gallon drum at 37RPM. Note: To compute revolving speed of other containers, multiply diameter of wheels by RPM of wheels and divide by diameter of container. V-belt and expandable pulley-type variable speed drive allows speeds from 76 to 190 RPM. Speeds can be changed when unit is operating. ML-745S Adjustable Drum Roller Constant Speed 115/230/60/1 P.O.R. ML-745VS Adjustable Drum Roller Variable Speed 115/230/60/1 P.O.R. ML-745D Adjustable Drum Roller Constant Speed 230/460/60/3 P.O.R. ML-745VD Adjustable Drum Roller Variable Speed 230/460/60/3 P.O.R.